Tears caused by jamming injuries are usually treated with splints. Splints hold the tendon in place and should be worn at all times until the tendon is healed. 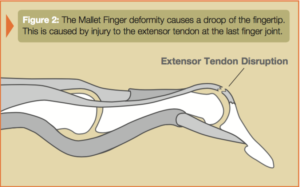 The tendon may take eight to twelve weeks to heal completely. Longer periods of splinting are sometimes needed. Your doctor will apply the splint in the correct place and give you directions on how long to wear it. Other treatment may include stitches (for cuts in the tendon). 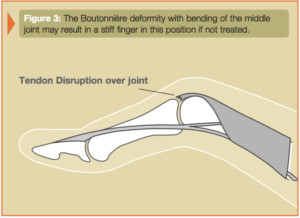 Also, a pin may need to be placed through the bone across the joint as an internal splint. Surgery to free scar tissue is sometimes helpful in cases of severe motion loss. After treatment, therapy may be necessary to improve motion. 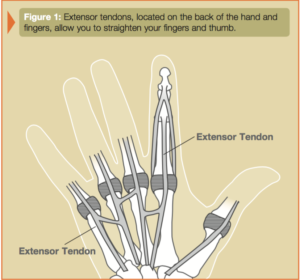 Consult your hand specialist for the best form of treatment.